After attending the public hearing about the permit that is to be issued to Georgia Power to dump waste and storm water into tributaries of the Turtle River, I have the following observations about the process and the proposed permit criteria. 1. Given that the public hearing was scheduled because of considerable public interest in how coal and other power plant wastes are to be dealt with, the limits placed on citizen speakers (3 minutes each) were not “reasonable,” especially considering that the applicant’s representative was permitted to ramble for eight minutes without answering any questions or providing any factual information. 2. That the citizens in attendance were not permitted to ask questions of the Hearing Officer rendered the event rather farcical. Such pro forma exercises do nothing for the environment and do not generate confidence in the citizenry that our regulatory agencies know what they are about. 3. That the presentation by the Department’s representative failed to address the water quality parameters, which compliance with the permit is supposed to protect, strikes me as a basic failing. Even a brief discussion of the fact that the receiving waters are classified for fishing might have prompted the observation that grab samples taken at the effluent point twice a week or even every day are not going to demonstrate that the fish are not accumulating heavy metals in their tissues. 4. Although mercury is a known contaminant of fish, why the sample test results presented for several months in 2017 indicate that mercury is N/A (not available or not applicable?) is a puzzlement. Never mind that a “Reasonable Potential Analysis (RPA) Calculation” for heavy metals is not reassuring. One suspects that the bottom line is that we are still relying on dilution as the solution to pollution. That coagulants and polymers are going to be dumped into the water to capture and isolate the suspended metals merely tells us that another chemical industry is going to collect some pay. 5. That the flow rate and TP are to be “monitored” hardly seems like a worthwhile condition for the issuance of a permit. That priority pollutant limits and aquatic toxicity testing requirements are yet to be determined suggests that the issuance of a permit for this facility is premature. 6. Finally, the notification for this hearing was grossly deficient. Both Representatives Jones and Hogan arrived for a 4:30 meeting only to discover it was not to be until 7:00 PM. I, myself, was set right by the spouse who was, apparently, on a different notification list. I note there is no time indicated on the agenda that was handed out. Sloppy staff work. Does not engender confidence. Of course, the whole issue of water quality is undermined by the fact that Georgia presumes that, if waters are already polluted, they can be polluted more, instead of the expectation that the industrial community as a whole bears responsibility and that what one has enterprise has contaminated another is expected to clean up. Why the body politic, whose natural resources have been despoiled, should be additionally burdened (by having to purchase potable water, for example, because pollutants have migrated to their wells) needs to be addressed. If the residents of Glynn County were all in the best of health, we’d have no complaint. But that is not the case. The January 2018 meeting of the DNR Board of Directors is scheduled to be convened at the Jones Heritage Center on St. Simons Island on the 26th. The agenda will likely be published two weeks in advance, according to Wes Robinson, the Executive Director. The public will be welcome to comment on agenda items both at the committee meetings, which precede the general meeting, and at the meeting of the full Board. I have asked how I could get on the agenda to address some issues of concern to the coast but have received no reply. Subsequent to the disruption caused by tropical storm Irma, the Coast Resources Division issued an advisory to cover emergency repairs. These are obviously not adequate for several reasons, if only because putting back what has already failed is a bad idea, even though the state has allocated eight million dollars for more rocks to be dumped on Jekyll Island. I have posted a paragraph by paragraph critique on Hannah Blog. https://hannah.smith-family.com/?p=18578 My comments are in italics. The British paper, the Guardian has published an article on dead zones in the oceans. It seems almost ironic that all environmental programs claim to address human needs, but still the environment gets trashed. Perhaps it is just that monetary return has become a substitute for the concerns of man. Economic development, aka the profit motive. 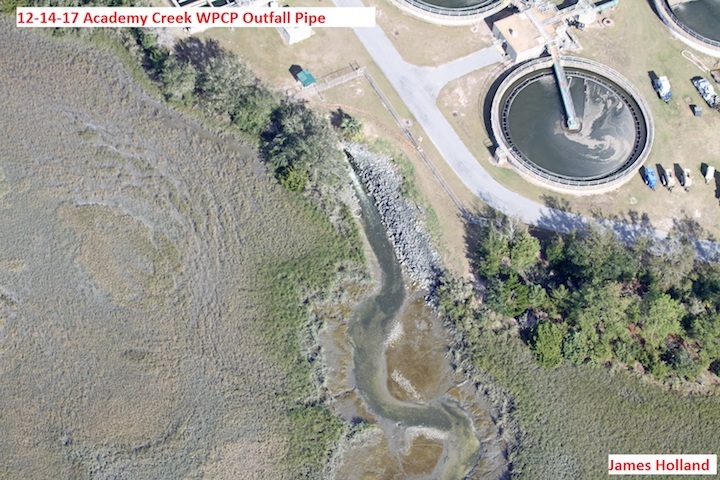 Meanwhile, here in Glynn County we are looking at $250 million needed to address deficits in our wastewater treatment and disposal systems and that doesn’t even contemplate an effluent that is non-polluting. In any event, there is much to call to the attention of the DNR Board of Directors. The Golden Isles of Georgia are an attractive venue for all sorts of governmental and eleemosynary organizations to meet and confabulate. Indeed, we expect the Board of the Department of Natural Resources to convene at least one meeting a year in our midst and look forward to seeing them on February 15, 2019 at the Jones Heritage Center on Saint Simons Island. Perhaps we can discuss whether shore and marsh protection are properly under the purview of the Coastal Resources Division whose primary focus is mercenary. The Georgia Ports Authority presented an annual review of the state of our ports on Jekyll Island not long ago and announced that the failing auto industry was looking to store more vehicles in hopes that soon people would have more money to buy new cars. We need to reverse the DECLINE in the value of Glynn County vehicles from $208 million to $75 million over the last ten years. The value of having cars transit through our port is hard to see. However, the importance of setting up a public transit system seems greater than ever. The Board of the Brunswick and Glynn County Economic Development Authority does not want to be seen this month at all. First they proposed to move the January meeting to exclusive Little Saint Simons. Then, when the public and the press objected, the meeting was relocated to a Georgia Power facility in SAVANNAH! Perhaps someone thinks that just announcing a meeting fulfills public information requirements? We’ve got news for them. Rep. Jeff Jones is concerned that agendas are not being published a week in advance. We are lucky if the “bwkeda” distributes agendas at meetings. All supporting documentation is apparently secret. Will we be able to ask in Savannah how come the Economic Development Authority is holding over $23 million in bonds for improvements at the Federal Law Enforcement Training Center whose workforce has DECREASED from 3,043 in 2008 to 1,051 in 2018. Seems like a sketchy investment. And why did the Economic Development Authority issue $10 million in revenue bonds for the Golden Isles airport which took in $14 million in grants for improvements that, in the end, only increased the value of capital assets by $2 million. Never mind why the EDA also contributed $500 thousand in cash. Lest I be accused of picking on the big guys, the Board of the Brunswick Housing Authority also likes to keep things hidden. Indeed, they meet at eight o’clock in the morning in a building that is closed to the public until nine. Not very welcoming. The occasional tenant that shows up, is quickly shushed away. Agendas are supposedly published on the internet, an unreliable venue as everyone knows. Something to work on in 2019. Despite lacking any authority to dump rocks and dig up the tidal area of the shores along Sea Island, SIA or its alter ego SIA PROPCO II is paying for an out-of-state contractor to make a royal mess, killing the benthic creatures and virtually assuring more of the beach will wash out to sea. or on the Coastal Watchdogs facebook page. Finally, the Glynn County Comprehensive Audited Financial Review will be presented at the January 17, 2019 meeting. I am hoping to find out just how many dollars they have socked away in balance, rainy day, contingency and unallocated accounts. After forty years, I am still convinced that agencies empowered to coerce support should not be hoarding dollars they do not need.